Celebrating a food holiday you’ve already honored previously is bittersweet. Literally. November 7 is National Bittersweet Chocolate with Almonds Day. OK, so it’s not exactly the same as National Milk Chocolate with Almonds Day (July 8) -but it’s almost identical to National Bittersweet Chocolate Day, one of our first challenges way back in January. Bittersweet chocolate is, by its very definition, bitter. It contains less sugar and more cacao for a rich, intense flavor that is best suited to baking. It is sometimes lumped together with semisweet chocolate and the two can be used interchangeably in most recipes, though semisweet chocolate does contain a little more sugar. The darker the chocolate the healthier it is for you, so eating bittersweet chocolate is akin to snacking on three broccoli florets. OK, not really, but we can pretend, right? Almonds are a natural pairing: 40% of the world’s almond crop goes to the chocolate industry. To celebrate, we split a Hershey’s bittersweet chocolate with almonds bar. I am not a fan of dark chocolate, and found it much too bitter (truth in advertising!) for my liking. Wouldn’t you know it, Tara liked it. For once, the tables were turned. I think this would have been better used in baking rather than eaten plain. If you’re cuckoo for cocoa, then today’s your day. July 28 is National Milk Chocolate Day! Chocolate is one of those things we’ve celebrated many times already this year, and I’ve talked about its history more than once. I’m too lazy to link to those various posts, but a quick Google search under “chocolate eat my words” (or a similar combination) brings up links to multiple chocolate-flavored posts we’ve already published. Be careful, though: a similar search brings up a 9-step process on How To Eat Chocolate Seductively (#3: Unwrap the chocolate bar or box with a gleam in your eye and a sense of purpose. #5: Place your tongue on the chocolate first. Oh, the hilarity). There are different varieties of chocolate, of course, and milk chocolate – while not as hip or trendy as dark chocolate these days – still holds a special place in many people’s hearts. It’s a sweet chocolate that contains milk powder or condensed milk, and is undeniably creamy and wonderful. In 1867, Swiss candlemaker Daniel Peter, who had recently started working in his father-in-law’s chocolate business, experimented with adding milk to chocolate in order to create a creamier product. Milk contains water, which makes chocolate separate and disintegrate, so Daniel tinkered with his recipe for eight years before bringing it to his friend and neighbor, Henri Nestlé, whose company had perfected the manufacturing of condensed milk for its line of baby food products. By adding Henri’s sweetened condensed milk to Daniel’s chocolate, they successfully created a milk chocolate that stayed together and tasted delicious. You no doubt recognize the Nestlé name, and are well aware of its dominance in the world of milk chocolate. You can thank Daniel Peter for that. To celebrate, we broke out a leftover Hershey’s chocolate bar from our camping trip last weekend. 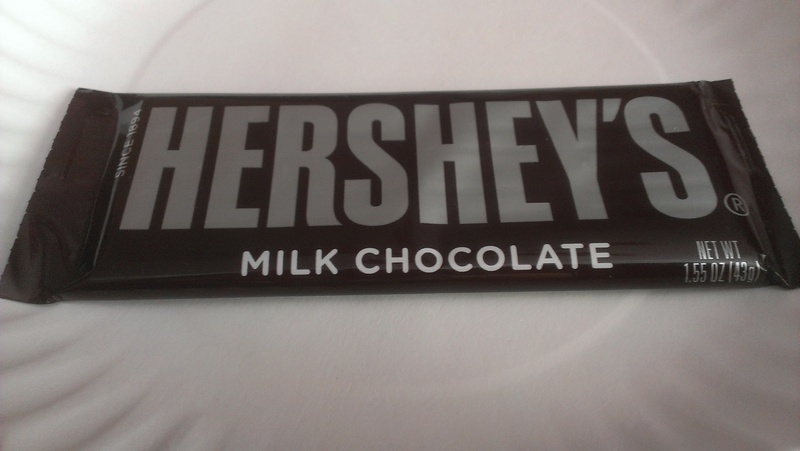 Nothing says milk chocolate like Hershey’s!